One of my favorite things about travel is experiencing natural beauty in a new place, and enjoying art. My day trip to Gangneung provided the opportunity for both. A couple months ago, my mother came to visit South Korea for the first time, and I wanted to show her a wide variety of Korea. One of her requests was to visit a beach, which was an easy request to fulfill since the country of South Korea is surrounded by the ocean on three sides and there are ample, beautiful beaches all around the country. Since the cold weather was setting in (it was late November when we did this trip), it wasn’t the time of year to go sunbathing or swimming in the ocean. But often times during cold weather, the sky is clear, and that really can produce some beautiful days with rich colors and bracing coolness. 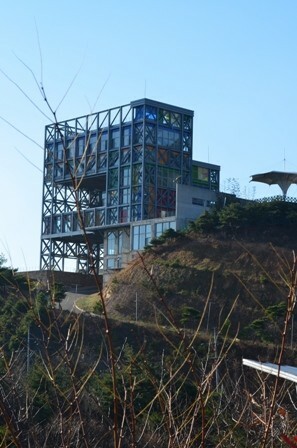 I elected to combine some different tourist options and make a day of it at Gangneung. 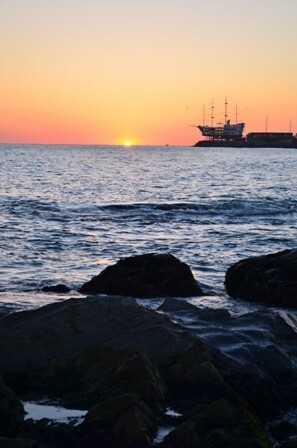 Gangneung is located on the East Coast of South Korea. 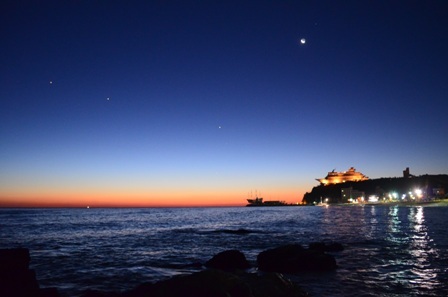 The beaches, particularly Jeongdongjin Beach, are a favorite for those of us who like to watch sunrises, and Gangneung hosts a very popular New Year’s Day Sunrise Festival. 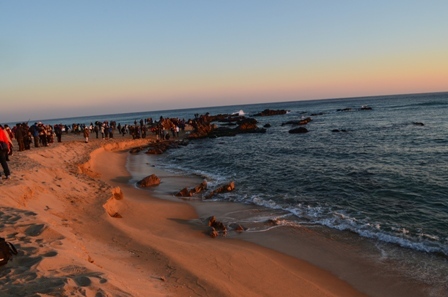 I went to a Sunrise Festival last year at Maryan-Ri, but I had no plans to be in Korea for NYE 2013/2014. 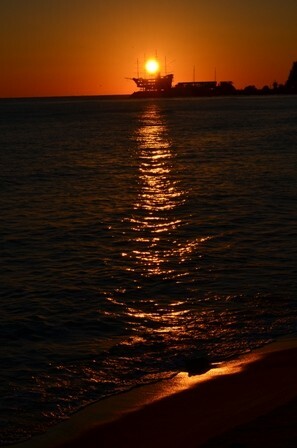 But I figured it would still be a good place to ring in a new day by taking in the sunrise at Jeongdongjin Beach. Thankfully Korean Rail makes it super easy to head out to Gangneung for a sunrise. 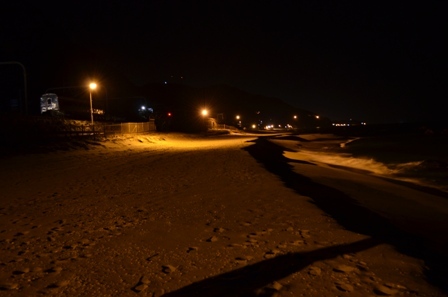 There is a night train that departs from Cheongnyangni Station in Seoul around 2300 every night and arrives at Jeongdongjin Beach around 0330. What was even more interesting is that the train was completely sold out and a huge crowd poured out into the nearby town. And when I say it arrives at the beach, I mean that literally. Jeongdongjin Beach holds the Guinness World Record for being the train station located closest to the ocean anywhere in the world. When my mom and I stepped off the train in the cold, early, pre-dawn morning, we could hear the ocean waves lapping softly on the sand, and we could see the ocean around 50 meters from the train station. It is rather cool to step off in the early darkness and be so close to the sea. We walked around a bit and eventually scored a seat on some of the large beach boulders to have an unobstructed view of sunrise. It was cold, but we were decently bundled up to stay warm. 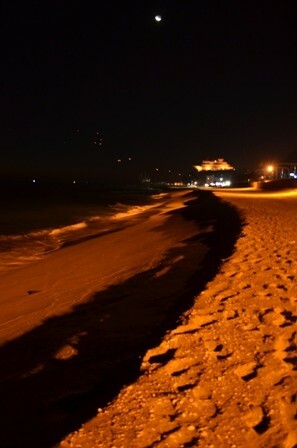 We could see these lighted lanterns released from farther down the beach and watched them float up and away. Soon, the pre-dawn light started to emerge over the horizon and slowly brighten the sky. Pre-dawn was actually fairly long, but eventually the light brightened even more and the sun peeked up from the horizon and greeted us for a new day. The sunrise was absolutely gorgeous as the weather was clear and cloudless, with surprisingly minimal wind. 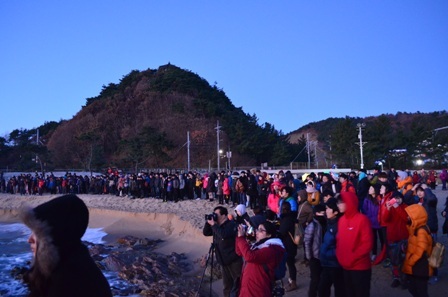 When the sun rose, I looked around and saw the huge crowd that had formed on the beach to watch the sunrise. I was very surprised at the amount of people on what was a normal November Saturday morning. It wasn’t New Years, or a special holiday. It was just a typical weekend, so I would guess that this is a common occurrence on weekends, particularly when the weather is good. 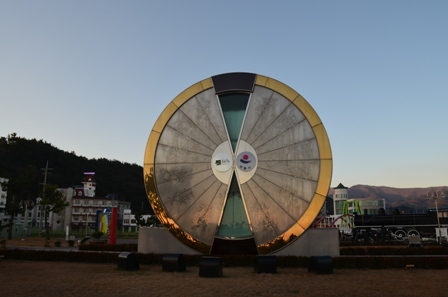 After watching the sun fully rise, we walked further down the beach to Morae Shigae (Hourglass) Park. This park was first built in late 1999 to ring in the new millennium. The centerpiece of the park is this huge, circular, sand hourglass. There is enough sand in the hourglass to last an entire year, and on New Year’s Day, the hourglass is rotated to start the sand falling anew. After a delicious breakfast of street food (steamed mandu and ddeok bokgi), the next stop was Haslla Art World. We took a cab (approximately 10 minutes drive) to the museum and sculpture garden. I have been to a wide variety of galleries around the years, but this gallery had some of the most bizarre (I mean that in a good way) and interesting modern art. The gallery is set up in this modernist building that is also a hotel, and it overlooks the sea. Our last stop of the day was at Jumunjin Beach, which is the northernmost beach in Gangneung. This beach was actually a bit of a challenge to find. We elected to save time (but not money) by taking a cab to the beach. However, the cab dropped us off at Sodol Beach, which is around the corner from Jumunjin Beach. After some hunting around, we found the beach. There are other beaches in the area, like the closer and more popular Gyeongpo Beach, but the reason I selected Jumunjin Beach was that there was a zip line that stretched across a small stretch of beach and ocean. I love me some zip lining, and figured it would be a nice view and ride. And I’m sure it was, when it was open. I determined that while the towers are still there for zip lining, there is no actual zip lining anymore. I’m not sure if they were just closed for the season (even though the weather was absolutely gorgeous), they were closed due to construction on the beach, or they were out of business entirely. In any case, Mom and I just walked up and down the soft sand beach and noticed a very interesting sign concerning military operations on the beach. 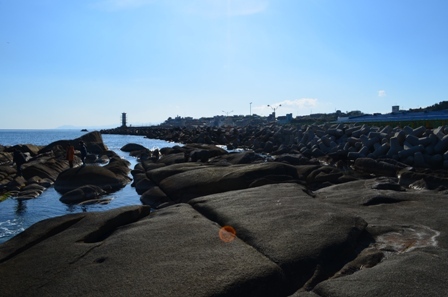 We eventually found our way back to Gangneung city, though it certainly wasn’t quick or easy. I knew there was a bus stop relatively close to Jumunjin Beach, but since we took a taxi to the area, I wasn’t sure where it was located. I was hoping to see a taxi stand, but we ended up walking back toward Gangneung, until eventually we managed to score a cab, because Mom threw herself in front of a taxi to stop it (not quite, but we were getting tired and desperate enough to try it). Even though we took the train to Gangneung, it was much more convenient to take a bus back. There were buses back to Seoul leaving around every 20 minutes, so soon enough we were plopped into a comfortable bus for a nice nap for the three and a half hour bus ride back to Seoul (Gangnam Express Bus Terminal). 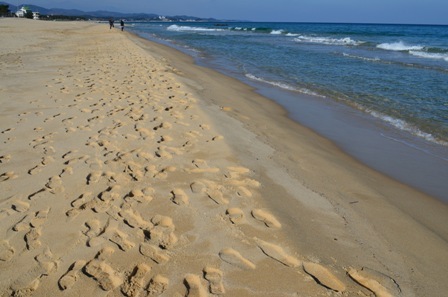 There is a lot to see and do in Gangneung, and you can have a very full day trip doing a wide variety of activities. 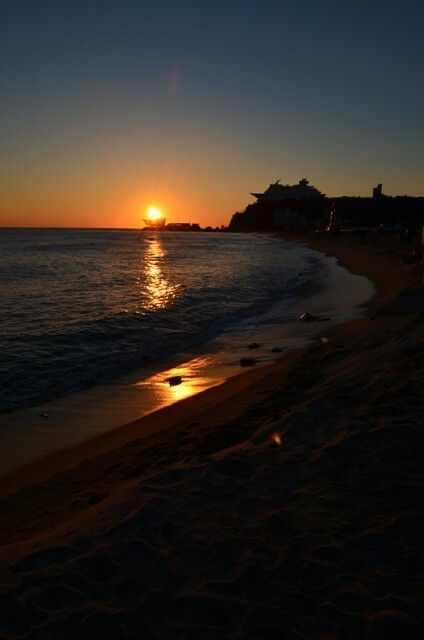 The biggest draw for the Gangneung area is beauty of the natural variety, particularly beaches and sunrises, but there is also beauty of the human variety (i.e. art). 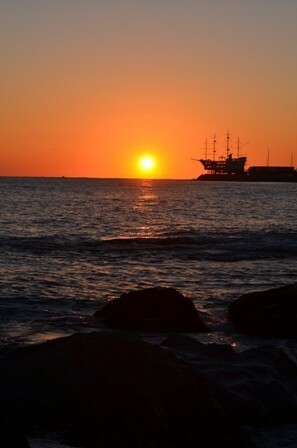 This entry was posted in Art, Travel and tagged Gangneung, Hourglass Park, Jeongdongjin Beach, Jumunjin Beach, Korean beaches, Morae Shigae Park, South Korea, sunrises. Hi.. May I check with you if there is a need to reserve a n unassigned/standing ticket from seoul to jeongdongjin? Probably not. I have taken many train trips bought with a last minute standing ticket. You can buy the ticket at the train station. It is just more comfortable to reserve a seat in advance. Otherwise you will have to stand, sit on the floor, or constantly move seats if they open up.